There has passed away another standard-bearer of our Holy Zion in the sudden death of our dear brother, Joseph Reed, of Newcastle-upon-Tyne second circuit. Brother Reed was converted some forty-five years ago during a revival in Allendale during the superintendency of the late Rev. 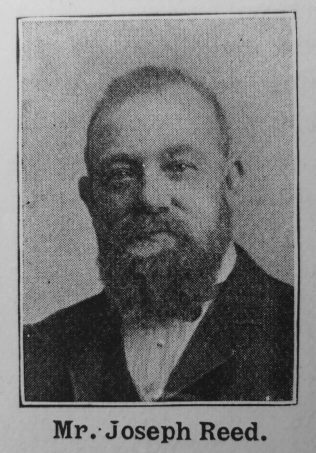 Colin C. McKechnie, a revival which has been lasting in its effect upon the spiritual lives of many who were compelled to leave the dales on account of the partial closing of the mines for the more populous and enterprising districts, but they carried with them the “pearl of great price,” a strong religious and spiritual character, and places of their adoption were enriched by their spiritual and intellectual life. Newcastle-upon-Tyne, the metropolis of the North, largely benefited by the influx of these brethren, and not among the least of them was Brother Joseph Reed. He came a lonely stranger, but soon found his palce in the Church and the pulpits of the North, where he was always welcomed, and always heartily received. He was beyond the average in intellectual ability and scriptural knowledge, and his sermons were thoroughly Methodistical; he aimed at no flourish or oratorial display, but preached the doctrine of a present, free, and full salvation, always appealing to the judgment and conscience of his hearers, and pressing home eternal truths and, verities. He was sound in the faith. While possessing a general knowledge of literature, he would have nothing to do with German Theology, but was a sound Methodist to the core. He rendered lasting service to the Brunel Street Society, out of which Maple Street Chapel sprang, now the head of Newcastle-upon-Tyne second circuit, in the erection of which he took a very prominent part, giving both time and money. When Brother Reed came from the Dales, he was a young man, strong, hale and hearty, and did his best to extend the kingdom of Christ, and Primitive Methodism on Tyneside. At the time of his arrival Newcastle was one circuit only. No brother preached more sermons both indoors and out than Brother Reed. He was a prominent preacher at the camp meetings held throughout the circuit. His brethren fully appreciated his work by sending him as delegate to district meetings and conference, and he always proved himself worthy of their choice. A few years ago he retired from a very active life, his nervous system being considerably weakened and shattered. However, he was still able to take an active interest in things. No one was more interested than he in the erection of our present Kingsley Terrace Church. As the leader also of a very large class in this church, he did invaluable work. On the Saturday before his death, in conjunction with the writer, he was anticipating a blessed morning service on the morrow, but alas, after the writer left him near 10 p.m., apparently in his usual condition, he took suddenly ill and soon after midnight the Master called him up higher, and “he was not for God took him.” Devout men carried him to his burial, and he had one of largest funerals ever held in connection with a Primitive Methodist in Newcastle-on-Tyne. All the ministers of the Newcastle Circuits were present, together with Revs. James Jackson and J. Young, who took part in the service. May we follow him, as he followed Christ. May his dear widow’s heart be cheered by divine consolation, and the affection shown to his memory by the brethren left behind. Mr. Reed was a deeply pious man, was possessed of strong convictions and decided views, which he never hesitated to express, for he was fearlessly frank and outspoken, but no one had a kinder or more sympathetic heart. His occupation until his illness, five years before his death, was that of a commercial traveller, a calling beset with many temptations. But here the worth of his religion was set in the boldest relief. His principles were not selected to be talked about, but to be rigidly adhered to. He was most conscientious in his business transactions and of the strictest integrity. He was a staunch total abstainer, and immovable in his convictions. Can we wonder that he gained the respect of all true men? Joseph was baptised on 19 May 1833 at Allenheads, Northumberland. His parents were Thomas, a lead ore miner, and Lydia. Census returns identify the following occupations for Jospeh. Joseph married Margaret Graham (1833-1902) on 14 March 1857 at Allendale, Northumberland. Census returns identify one child. Joseph died on 22 May 1899 at Newcastle upon Tyne.